In recognition of its high standard of achievement in golf literature, St. Andrews: In the Footsteps of Old Tom Morris, by Roger McStravick, is the recipient of the United States Golf Association’s Herbert Warren Wind Book Award for 2015. McStravick’s careful curation allows readers to experience the undercurrent of Old Tom’s life and provides a unique perspective on the entrepreneurs, golfers and friends who made a living in the historic town. Considered the best golfer of his time – he won The Open Championship four times, all at Prestwick between 1861 and 1867 – Morris was also a prolific designer, credited with work on approximately 70 golf courses, including the Old Course at St. Andrews, Muirfield, Prestwick, Carnoustie, Royal County Down and Cruden Bay. In addition to being a strong supporter of women’s golf, Morris is often credited as being the key proponent of spreading the game worldwide. 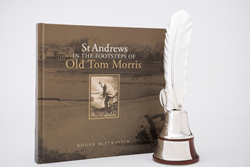 St. Andrews: In the Footsteps of Old Tom Morris is the third book in the past decade to win the Herbert Warren Wind Book Award with Morris as the subject matter. Tommy’s Honor, by Kevin Cook, was recognized in 2007, and Tom Morris of St. Andrews: The Colossus of Golf 1821-1908, by David Malcolm and Peter Crabtree, was honored in 2008. It took McStravick three years to research, write and collate the images for the book. Many people helped in the effort, including descendants of the great golf families and landowners of St. Andrews. The majority of the images came from The R&A, the St. Andrews Preservation Trust, Master Works of Golf and the University of St. Andrews. The book’s foreword was provided by Prince Andrew, the Duke of York. McStravick has written for the British Golf Collectors’ Society magazine Through The Green, as well as Golf Illustrated, HK Golfer and organizations such as the Ladies Golf Union and the St. Andrews Links Trust. He has written scripts for Golf History with Peter Alliss and served as an advisor for Jean van de Velde’s Scottish golf and travel TV show on Golf Channel. He has been commissioned to write A History of Golf and The Fine Art of Golf. McStravick, who has a master’s degree in golf course architecture, lives in St. Andrews and is an avid collector of rare books about St. Andrews. The Herbert Warren Wind Book Award was established in 1987. The award recognizes and honors outstanding contributions to golf literature while attempting to broaden public interest in, and knowledge of, the game of golf. Wind, who died in 2005, was a famed writer for The New Yorker and Sports Illustrated who coined the phrase “Amen Corner” at Augusta National Golf Club. He is the only writer to win the Bob Jones Award, the USGA’s highest honor. The USGA is currently accepting submissions for the 2016 Herbert Warren Wind Book Award. To be eligible, a book must be an original full-length work about golf, written in English, and must have been published between November 2015 and October 2016. For more information, contact Nancy Stulack, the USGA Museum’s librarian, at 908-781-1107 or nstulack@usga.org. The USGA conducts the U.S. Open, U.S. Women’s Open and U.S. Senior Open, as well as 10 national amateur championships, two state team championships and international matches, attracting players and fans from more than 160 countries. Together with The R&A, the USGA governs the game worldwide, jointly administering the Rules of Golf, Rules of Amateur Status, equipment standards and World Amateur Golf Rankings. The USGA’s reach is global with a working jurisdiction in the United States, its territories and Mexico, serving more than 25 million golfers and actively engaging 150 golf associations. The USGA is one of the world’s foremost authorities on research, development and support of sustainable golf course management practices. It serves as a primary steward for the game’s history and invests in the development of the game through the delivery of its services and its ongoing “For the Good of the Game” grants program. Additionally, the USGA’s Course Rating and Handicap systems are used on six continents in more than 50 countries. For more information about the USGA, visit http://www.usga.org.